While her father had made clear prior to his dementia that he wanted to die a “natural death,” what he got what he got was an unnatural “death by medicine,” as someone once put it. The total cost for the hospital stay alone was $323,000. Again and again Krieger had to make a decision about going on, as one crisis after another surfaced. With each new crisis, the doctors offered hope. There was, they said, “a decent chance we could turn it around.” They could not, and he finally died. But as the days moved along from one crisis after another, Krieger kept asking herself, Was it all worth it? “Should we have quit?” she wrote. And when? I have come to think that the decisions about stopping life-sustaining treatments may have become harder, not easier, since the 1960s, when the reform movement was gaining momentum. Medicine has become increasingly skilled technologically in keeping the dying alive. Her father, Krieger noted, “thanks to modern medicine . . . lived decades longer than his father.” That same medicine gave him a miserable death. That is a dilemma of modern medicine we have yet to resolve. via Bioethics Forum blog – The Trial of “Death by Medicine”: An Interview with Lisa Krieger. Bioethics Bootcamp is presented by Science Writers in New York, The Hastings Center and the City University of New York Graduate School of Journalism and is supported in part by a grant from the National Association of Science Writers. Reference to any specific commercial product, process, or service does not necessarily constitute or imply its endorsement of or recommendation by the National Association of Science Writers, and any views and opinions expressed herein do not necessarily reflect those of the National Association of Science Writers. 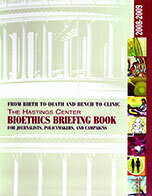 The Hastings Center Bioethics Briefing Book for Journalists, Policymakers, and Campaigns contains 36 overviews of issues in bioethics of high public interest, such as abortion, health care reform, human and sports enhancement,organ transplantation, personalized medicine, medical error, and stem cells.